Our Hopland facility and winery. Olivino is located on the beautiful 65-acre Sanel Valley Vineyards in Hopland, Mendocino County, about 100 miles north of San Francisco. 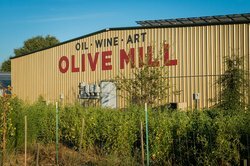 Our facility covers 9,600 sqf for olive oil milling and production, and a 6,000 sqf climate-controlled wine and oil storage warehouse for bulk and cased goods. We are surrounded on three sides by many organic vineyards and panoramic hills. Access from and to Highway 101 is easy, allowing rapid and convenient deliveries. Hopland is known for its fine wineries in the southernmost grape-growing region of Mendocino county. Sarcina, Fetzer, Brutocao, Bonterra, and McDowell are some of the few that have added Hopland to the greater food and wine destinations several decades ago. Recently, the number of new olive growers in the region has increased by about 20% per year. We are also certified organic by the CCOF (California Certified Organic Farmers) and Demeter as a mixed-use facility.